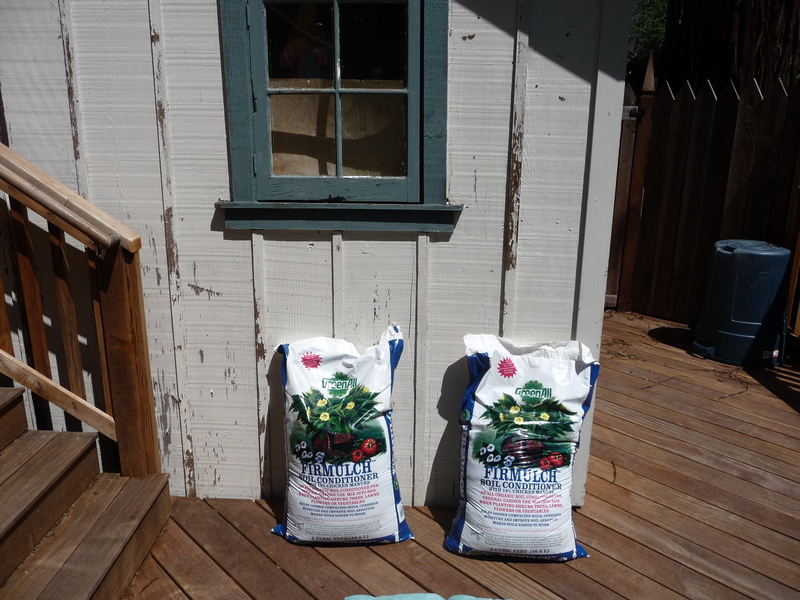 It looks a little white trash, but this year we’re gardening in bags of potting soil (plus a few boxes). 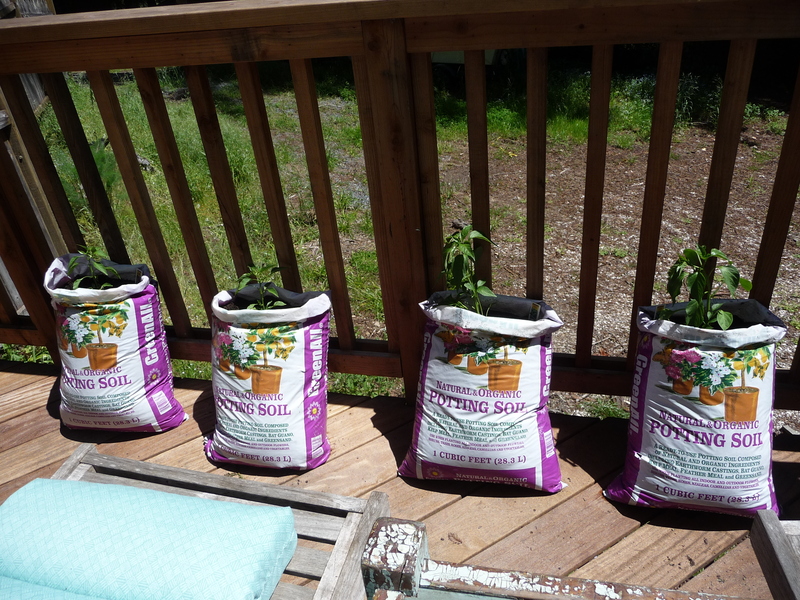 We see the bag technique every year at Berkeley Hort, where they always have a few demonstration bags with happy, pest free, supremely productive tomatoes. 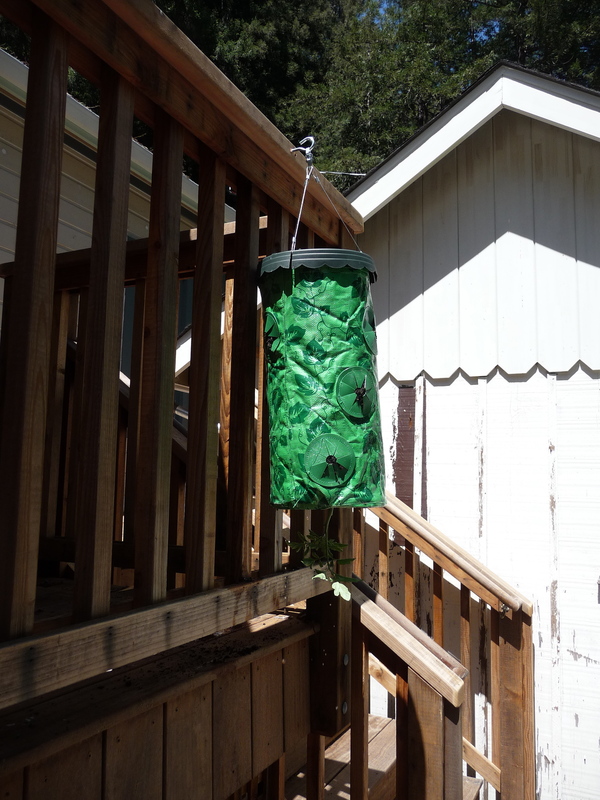 We asked them about it and they said it works so well because tomato diseases get into the soil and when you do it this way your tomatoes are always in fresh soil. 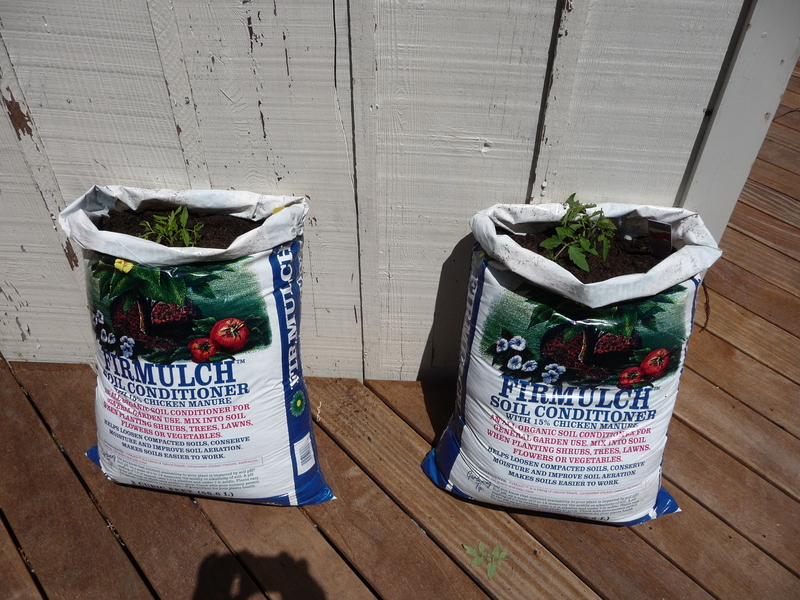 We have a garden at home every summer but we never did the garden-in-a-bag thing because, frankly, it looks kind of crappy. 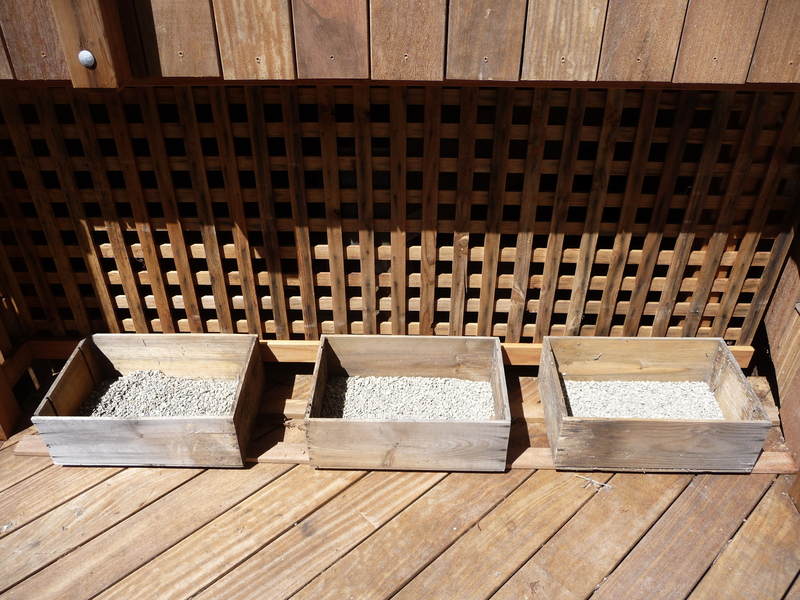 But the Schoolhouse is in Sonoma County, where the climate is perfect for things like tomatoes and peppers, and we can’t help ourselves – we have to try to grow some. 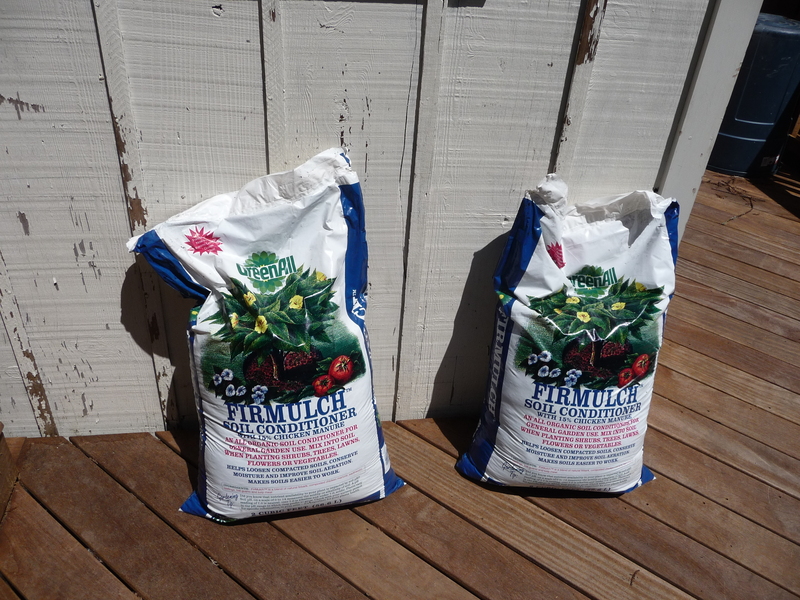 And the bags are the perfect solution because until we build a fence and a gate to keep the deer out (not to mention deal with the hardscaping), we really can’t plant a garden. 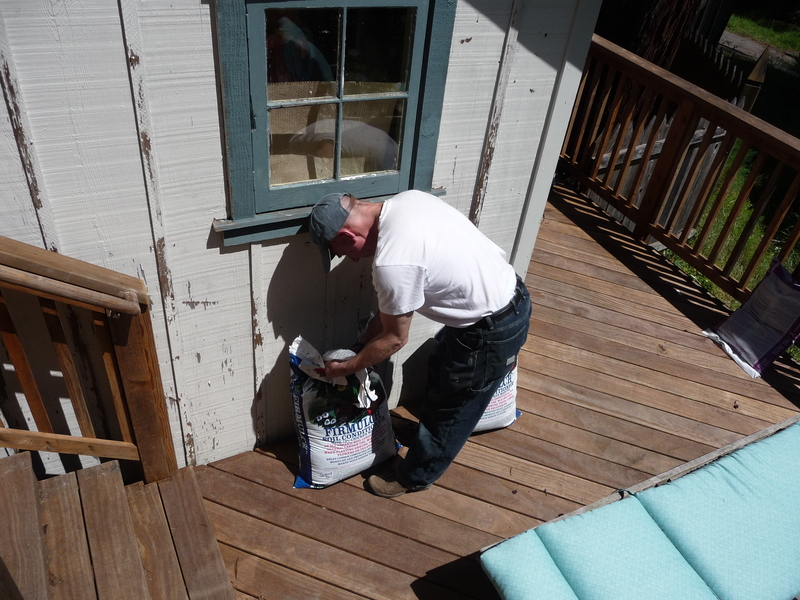 Bags and boxes on the deck are this year’s solution. Start by poking a couple of holes in the bottom of the bag and setting the bag up on that end (irrepressible proofreader that I am, I insisted all the bags be right side up and facing the same way). 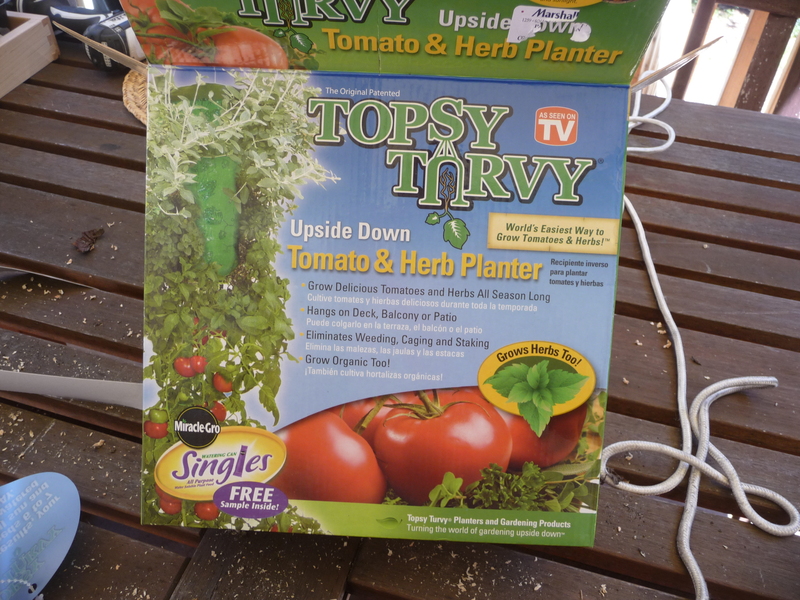 And then, of course, there was the Topsy Turvy Tomato grower I found at Marshall’s. Topsy Turvy gardening - myth or reality? I am such a garden geek, I’ve wanted to try these forever. It says you have to water it every day, which won’t be possible because we are not at the Schoolhouse every day, but it also says to put up to 9 plants in it. 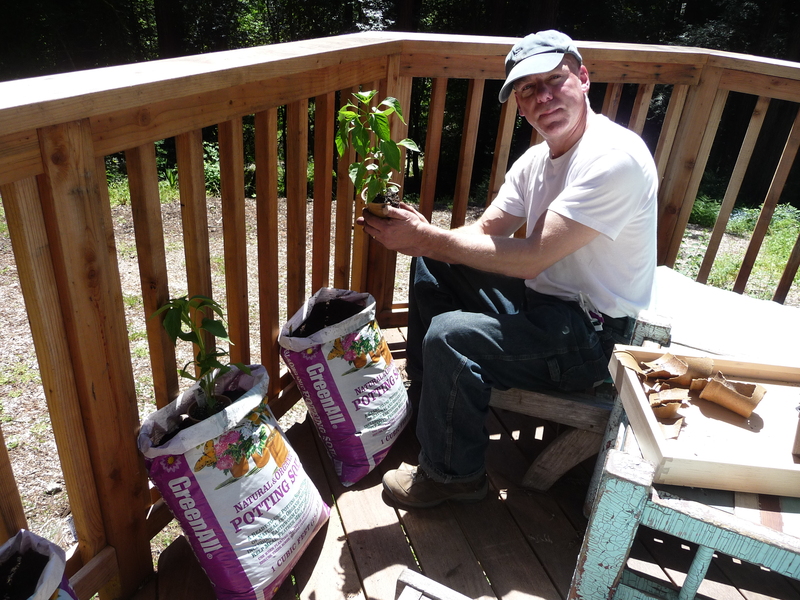 We’re hoping that with just one tomato plant, it will make it between weekend waterings. Please wish it luck! And then there are the boxes. 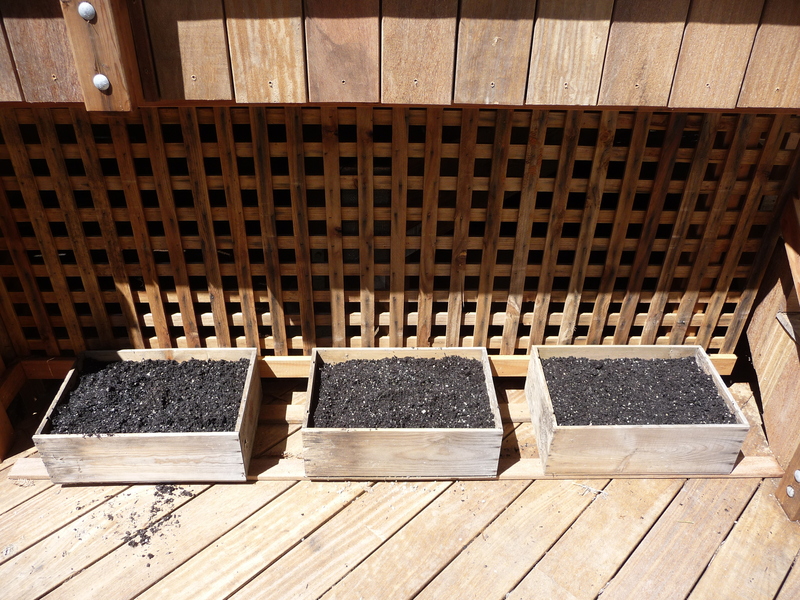 Add herbs and lettuce starts: grow babies grow! 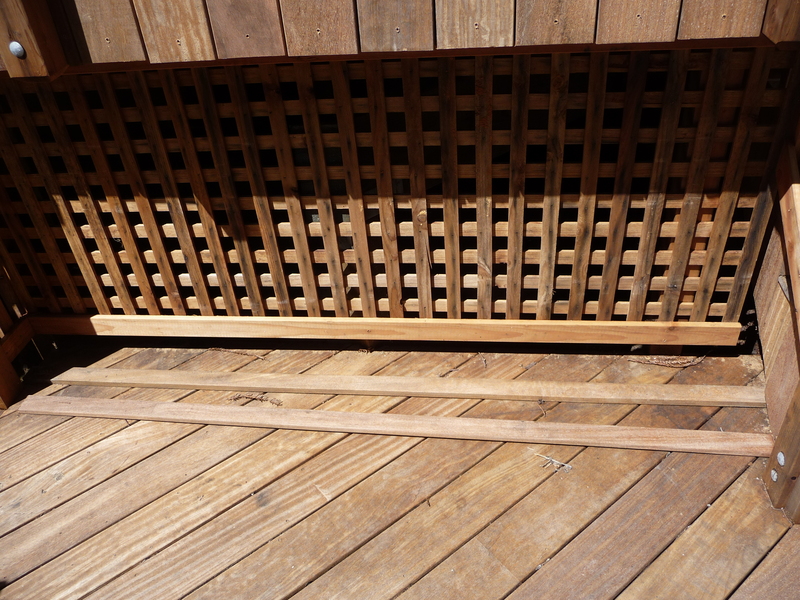 Any other clever ideas for deck gardening, please share! 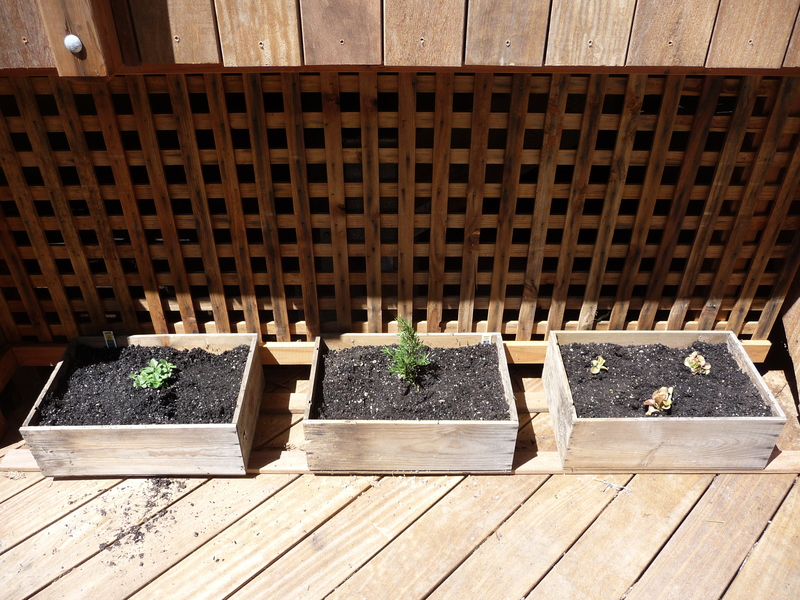 Previous I beg your pardon; I never promised you a… stump garden?